ENJOY THE BEAUTY OF MARAS AND MORAY BOOK NOW! The Incas built thousands of platforms for the cultivation of various products such as potatoes, sweet potatoes, tomatoes, quinoa and more. Perhaps the most beautiful of all was Moray, a circular system of platforms that survives to this day. Nearby, there are some natural salt wells formed thousands of years ago. 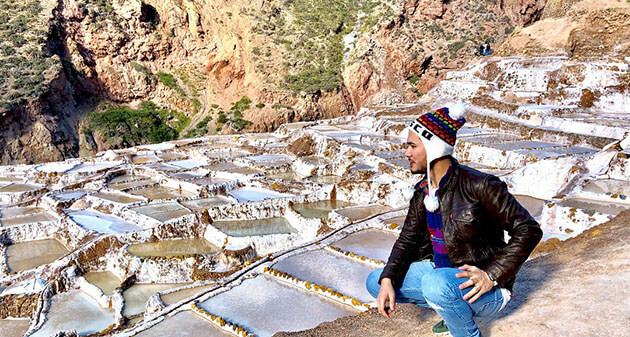 This place is called the Salineras de Maras and, together with Moray, are two of the most popular tourist attractions in Cusco. Pick up from the tourist from the door of your hotel. Entrance ticket to Maras and Moray. Transportation service during the whole tour. Tourist Ticket of Cusco: Entrance to Maras and Moray. 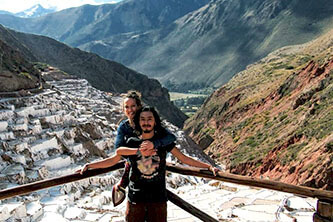 The tour to Maras and Moray is a tour through one of the most beautiful landscapes of Cusco. It goes through Moray's Inca circular terraces as well as the famous salt mines of Maras, made up of thousands of natural salt wells used since the Inca period. 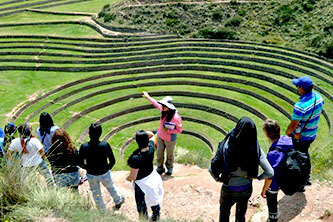 The Maras and Moray tour in All-Inclusive Service offers a safe and well-organized experience. Includes pick up from the tourist from the door of your hotel, income tickets to Maras, Moray, the transfer during the entire tour is by minivan. The service also includes the tourist guide service in English or Spanish. The tour begins with the pick up of the tourist from the door of his hotel in the city of Cusco. I pick up in a minivan. 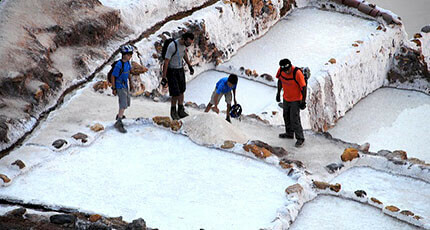 The tour includes the entrance to the tourist attractions: the salt-plants of Maras and Inca platforms of Moray. The tourist will not have to queue to buy the tickets. The minivan is spacious to provide maximum comfort to tourists. The shared service is organized with a minimum of 7 tourists. The visit to the tourist attractions is done with the company of an official tour guide. The shared service is in English or Spanish. 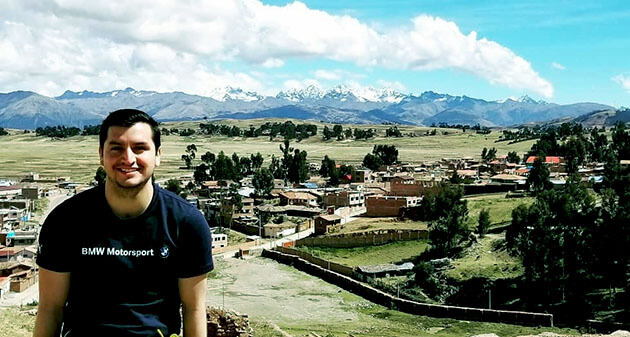 Visiting Maras and Moray with Machu Picchu Terra offers many benefits: the service is organized by a tourism agency with years of experience in the tourism sector. Communication is easy and constant. Payment methods are fast and secure. The tour to Maras and Moray is a service organized by Machu Picchu Terra, tourism agency with official authorization from the Ministry of Culture of Peru (code MA0473). The tour offers constant communication before and during the tour. 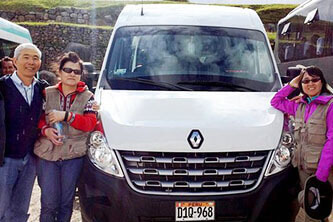 The tourists can communicate to info@boletomachupicchu.com or to the 084 - 403077. The tour can be paid directly thanks to the payment system with Visa, MasterCard, Diners Club or PayPal. The payment is protected with an internet security system. The tour is organized by professionals in the tourism sector. Every detail is planned to provide security and confidence to the tourist. Why meet Maras and Moray? 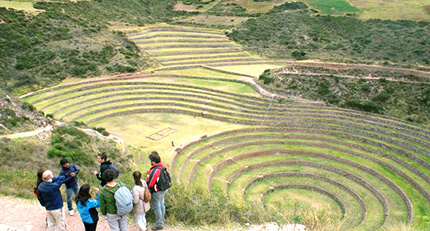 Maras and Moray are one of the most popular tourist attractions in Cusco. Tourists visit it because of the incredible natural beauty of these landscapes. An adventurous alternative to this tour is the ATV tour. The rate includes the tourist guide service, the Tourist Ticket of Cusco, transportation and the pick up of the visitor from the door of your hotel. The prices are in American dollars. The tour offers some of the best landscapes of Cusco. The traditional village of Maras is visited first. Then, continue through the archaeological site of Moray. Finally, we go through the salt mines of Maras. 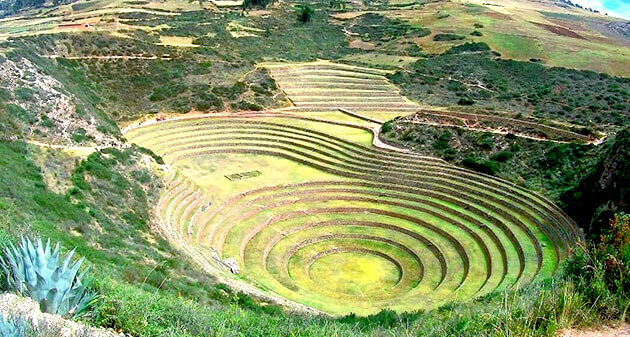 Moray is an ancient Inca andenería system in the form of an amphitheater. There the Incas domesticated various agricultural products from different geographies. Its beauty made it an important tourist attraction. The Salineras de Maras have more than 2 thousand natural salt wells. The Incas exchanged the salt of Maras for hundreds of years. The beauty of the landscape also made it one of the most popular attractions in Cusco. Maras is a historic town during and after the Incas. There settled the Cusco nobles deprived of their property by the Spaniards. It still conserves the colonial chapel made of adobe. The tour starts with the tourist pick-up from the door of your hotel. Then you will travel through the Sacred Valley of the Incas until you reach the town of Maras. You will travel this famous town until you reach the Inca platforms of Moray. Finally, we will visit the salt mines of Maras and then return to Cusco. 8 a.m. - 8.30 a.m.
We pick you up at the door of your hotel. We go on our transport to the traditional town of Maras. There we will visit its historical streets as well as its colonial temple. Then we will go to the Inca ruins of Moray (7 kilometers away). There we will visit its beautiful andean system in the company of a specialized guide. 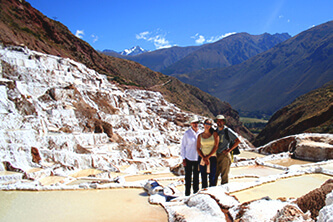 11.30 a.m. - 1 p.m.
We continue with the tour, visiting the popular salt mines of Maras (7 kilometers from Moray). We will visit your natural salt wells with the tour guide. The shared service is organized with tourists from different places. The tour is at least 7 people. It includes the pick up of the tourist in the hotel and the service of official guide of tourism in English or Spanish. The tour begins with the pick up of the tourist from the door of his hotel in the city of Cusco. The tour to Maras and Moray allows a minimum of 7 visitors per group. The tour guide service is in English or Spanish according to the needs of the tourist. 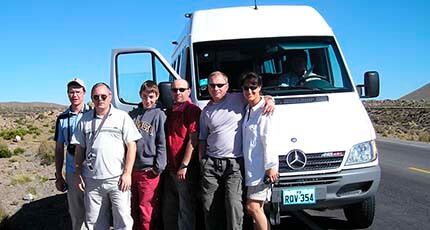 The private service is organized for tourists traveling with family or group of friends. The tour can be done with a group of 2 visitors. Includes pick up and return to the hotel. In addition, the tourist guide service in English, Spanish or another language. The private service begins with the pick up at the door of the tourist hotel. During the return, the transport will leave you at the door of your hotel. The private service can be organized with a group of at least 2 people. The official tour guide is exclusive for private service. The guide is in English or Spanish. The tour in private service is more dynamic and with more flexibility in the times because the service is exclusive for a small group. HOW IS THE CLIMATE IN MARAS AND MORAY? The climate in Maras is dry, cold and with enough rain. Its average temperature is 12ºC. Moray, on the other hand, has diverse microclimates according to the ecological floor of its platforms. The average temperature is 14ºC. What to take to the tour to Maras and Moray? For the tour it is recommended to bring: hat, sunglasses, sunscreen, comfortable clothes, windbreaker jacket, water, rain poncho, camera, snacks and extra money if you want to buy handicrafts. Tourists interested in visiting Maras and Moray asked the following questions. 1) When is the best time to visit Maras and Moray? The dry season (April to October) is the best time to visit Maras and Moray. The days are sunnier and there is less chance of rain during those months. 4) Is the tour to Maras and Moray dangerous? The only problem during the tour can be caused by altitude sickness (headache, nausea, discomfort). For the rest, the tour is safe and well organized. 2) How to book the tour to Maras and Moray? Complete the personal information of the visitors. Make the payment (at least 60% of the value of the tour). Once in Cusco (at least 1 day before), complete the full price of the tour. 5) Are the schedules flexible? Yes. At the request of the visitor, you can stay a few more minutes in a certain place prior coordination with the tour guide. 3) Can I suffer from altitude sickness in Maras and Moray? Altitude sickness is a condition caused by the lack of adaptation of the tourist to high altitude climates. It is recommended to adapt to the climate of Cusco at least 1 or 2 days before the tour. ENJOY THE BEAUTY OF MARAS AND MORAY! - RESERVE NOW!